Amazon’s choices of its top 20 look a lot like what I expected. The key words would be … access to DC, access to Europe, good mass transit, good housing stock and GREAT TALENT POOLS. My bets have been and still are on Toronto and Philly. These two share a lot. High on the list is great universities and great culture. Toronto has a great offer … away from the Donald. Canada has great ties to both the EU and the Britain. They also remain within NAFTA, But best of all the University of Toronto is world class and nearby University oif Waterloo is a premier comp sci place. 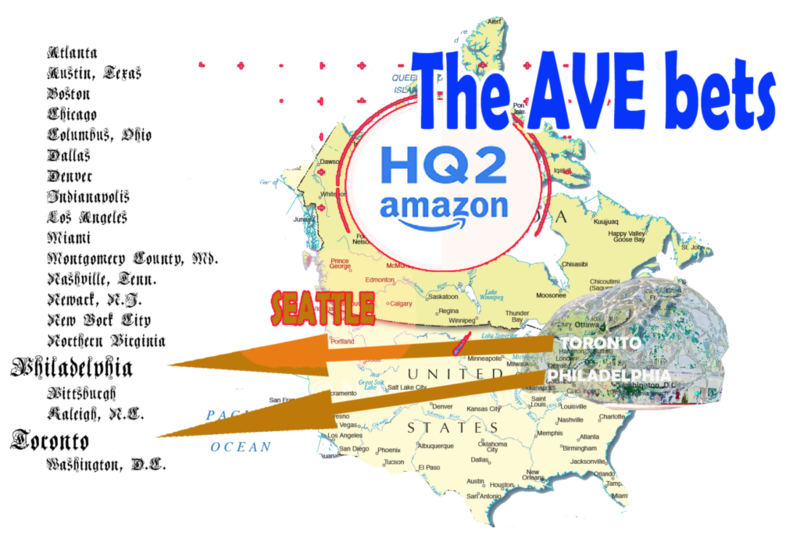 And, with a well run immigration process, Amazon Toronto will draw talent blocked from the US the Trump! On my list, Philly is number 2. Philly has the best universities in the US outside of Boston and the Bay Area. Even aside from U Penn and the other schools there, across the river is Princeton. It is also very close to the world HQs for the pharma industry, a key issue as Amazon takes its expected move into healthcare and pharmacies. OH yeh, a short TRAIN ride to NY and DC without the mess of living in either city! Posted 18 Jan 2018 by theaveeditor in Misc. ← I’m not making this up, Trump has declared Jan 20 a national holiday in tribute to his election.